What happens when an important document like a deed or a mortgage has been recorded, and an error is spotted after the fact? What can you do to fix it? One option may be filing a corrective scrivener's affidavit. A scrivener's affidavit is an instrument containing sworn statements by the affiant, or person making the affidavit, that sets forth the intent of the original document by correcting a non-material error in a document which has been recorded at an earlier date. 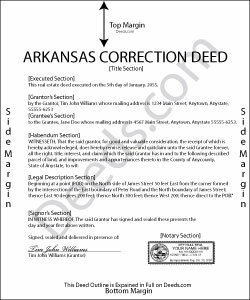 The Arkansas statutes specifically state that scrivener's affidavits may be used to correct the following: the identification, marital status, heirship, relation, death, or the time of death of a person; the identification of a corporation or other legal entity;or the legal description to real property (A.C.A. 18-12-108). Major, or material, changes to the substance of the document have a legal effect in how property is titled, and therefore require a new deed. Adding or removing a grantee, for example, or making significant modifications to the legal description, may require a new document. When in doubt about the gravity of an error and the appropriate vehicle to address it, consult with a lawyer. In order to be valid, the affidavit must include the name of the person or entity that completed or prepared the original instrument, and the names of all parties to the original instrument (A.C.A. 18-12-108). If the person's name has changed in the time since the erroneous document was recorded, a new document is typically required. The affidavit must also include the recording information from the original instrument. And of course, the affidavit states a brief description of each error and the correction itself (A.C.A. 18-12-108). Because a scrivener's affidavit is correcting another document where the transfer tax has already been paid, it is exempt from said transfer tax pursuant to A.C.A. 26-60-102(3). Contact a lawyer with questions if no tax was paid on the recorded document. The affidavit must be executed and recorded by one of the individuals listed in A.C.A. 18-12-108 who were party to the original document. The affiant must sign the document in order for the correction to be valid (A.C.A. 18-12-108). It must also meet all state and local standards for recorded documents. Submit the completed affidavit at the circuit clerk's office in the county where the real property is located (A.C.A. 18-12-108). This article is provided for informational purposes only and is not a substitute for legal advice. Contact an attorney with questions about scrivener's affidavits, or for any other issues related to real property in Arkansas.